We’ve all had those freakouts, real or imagined of oversleeping a final exam or showing up late to an important job interview. In my case, most recently, they’re usually race related; realizing my goggles are missing moments before the swim start or getting into T1 to find my bike has been replaced by a unicycle, etc. Fortunately these events are way more delusions than a reality, although I did oversleep Calculus and half of a World Civ midterms in college once. 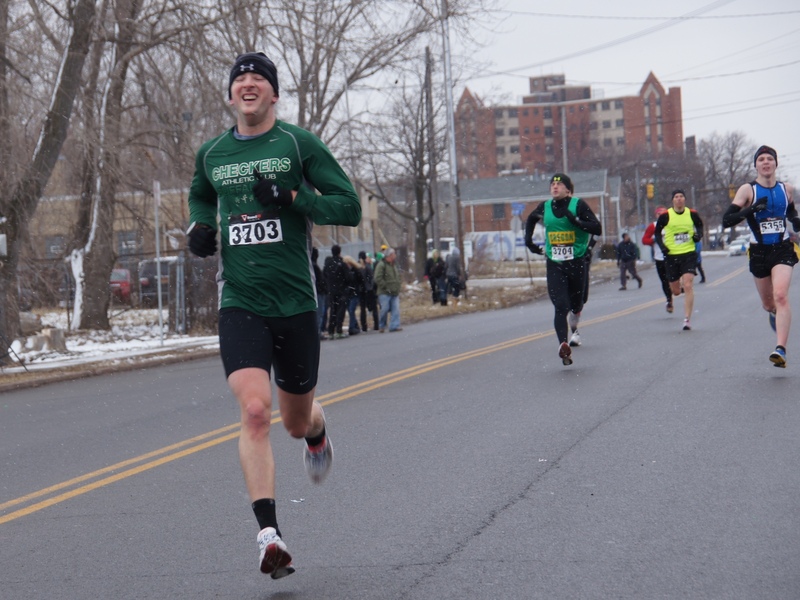 Unfortunately, this year’s Shamrock Run was one of those real world exceptions. Everything leading up until the race went fine. I finished my 3 hours of workouts Friday early enough to catch the Conference Championships in swimming at UB, had my protocol QT2 pre-race dinner, got plenty of sleep, and showed up to the race almost 90 minutes prior to start for a proper warm-up. Even though I was ending a 17 hour week I felt pretty good and watching swimming the night before had me so fired up I was beginning to contemplate my college PR of 26:15 as not so entirely out of grasp. It was a very cold day and despite low 20 degree temps I had decided to race in shorts and a shirt. As such I wanted to spend as little time outside before the race as possible. It was so frigid when I exited the Old Ward to head to the race start I decided to stop by my Jeep for some warm-ups. 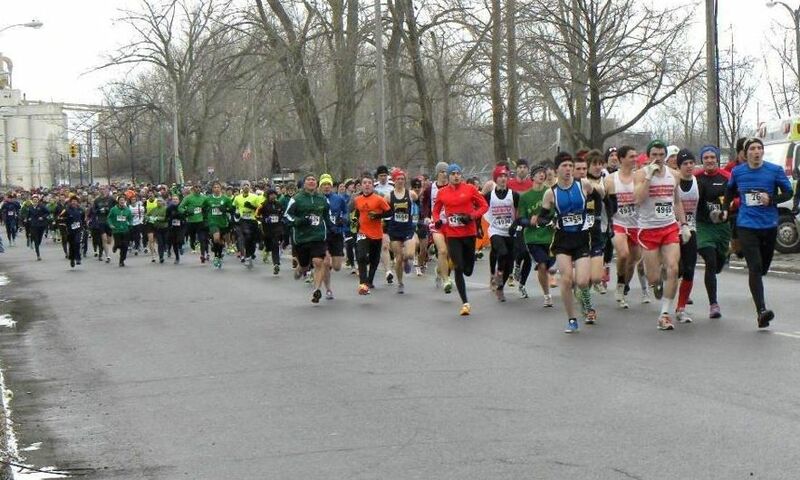 It wasn’t until I rounded the corner to a sea of 5500 racers that I heard it, “POP” the sound of the gun firing to signal the beginning of the race, and me almost entirely in the back!! I’m not proud of what I did in those following moments. The sound of the gun caught me completely off guard and my competitive nature had me seeing red. I ran through the crowd as best as I could, hopped a barrier, ripped off my warm-ups and crossed the start about 2 minutes into the race (still a minute before noon according to my Garmin). From there I yelled, shoved a little, and may have accidentally spit on an innocent bystander (spitting for me is an involuntary race mechanism that I don’t even think about and for that poor woman who just wanted to catch the race start I I’d like to give my deepest apologies!). I had a goal of going out in 5:20 but I was surrounded by thousands of runners some going as slow as a walking pace, so it seemed like any hopes of a successful race were gone. It was at that point, in the midst of winding my way through a crowd of racers that I started to think about why I was doing what I was doing. 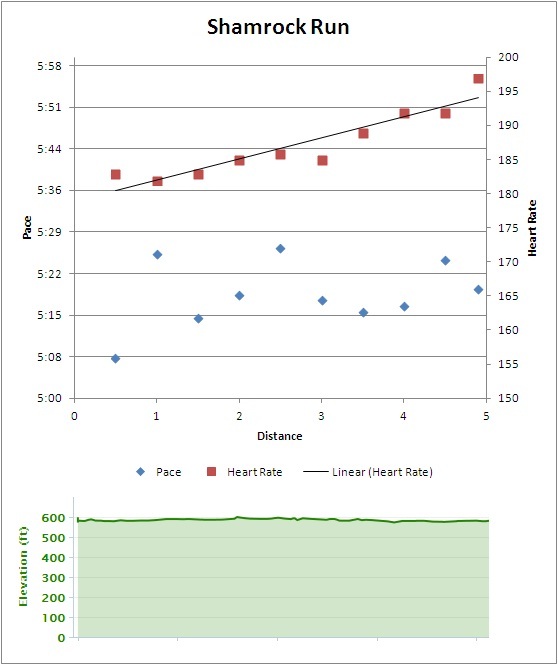 My PR was out the window, gun timing precluded me from any awards and I was in such a rush I didn’t know if I had started my Garmin, so I wasn’t even expecting data out of the deal. The fast guys were all uncatchable. For a moment I thought about racing oldschool, to relish in the pain but to that point abruptly argued, what’s the point of pain without reward?? Fortunately that’s when my Garmin beeped, “0.50 miles, 5:08 pace”. Even with all the chaos, zigzags and nudging I had hit my target start pace! The rest of the race is your typical 8k with the exception of start to finish I estimated passing about 2000 people. I was upset about losing the opportunity at my “fast time” considering this will likely be my last road race of the season. The feeling was accentuated by the knowledge that I only get about 1 hour of competition for every 100 trained and it will be months until I get my next shot. 28:00 gun time, 26:48 chip time, 26:17 Garmin time and even with the late start 2/294 in AG. I feel ashamed for how I handled the start of my race, pushing, shoving and even spitting, but I still question if it was the right thing to do. I feel I gained from this race a better understanding of why I do what I do. People race for all different reasons and none are necessarily less important than the rest. Some like the social aspect, some the afterparty, some the pain (I refer to these guys as the tough mudder’s) and some just want to finish. I’m something of a blend of do my best and win. I don’t expect to win an 8k of 5,500 runners, especially with college athletes running 100 miles to my 40 tops, and I don’t want to settle for the “do your best” of kindergarten PE. What attracts me the most to racing is the concept that if you train like the best, pick your race and are dedicated enough why shouldn’t you win races. Anyway, lesson learned, tomorrow’s a new day, full steam ahead! Nice race report dave. Very thoughtful and a good read. Nice outfit. You must have been freezing out there! Real funny though! What is a 17 hour work week, Welby?! 17 hour workout week Erica!! That’s not so bad for me. I’ll get up to 24 hour weeks this summer.